When we talk about Future Communications we often talk about some of the best ideas that higher education institutions are generating. This time we’re taking a different approach. Whilst our focus is still universities, campuses and students, our lead protagonists are quite different. This is a quick look through some of the best marketing communications campaigns we have seen in this space. We’ve majored heavily on the graduate recruitment campaigns led by some of the biggest companies out there – mainly because of some obvious synergies between them and university student recruiters. However, we’ve also looked at a couple of big name consumer brands to give you some extra inspiration, possibly even some wings. 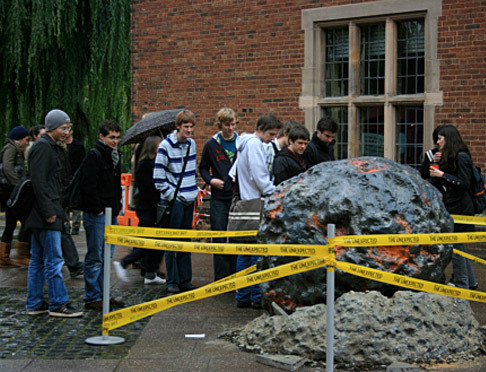 We start with meteors crashing into UK campuses a few years ago. Of course they weren’t real meteors. Nor did they crash. It just looked like they did. They were in fact blow-torched replicas, unloaded from vans in the middle of the night, and positioned carefully on selected campuses. Throw some police tape in and it looked stunning. It certainly got the students talking. This had all been staged by Lloyds of London (with their agency Havas People) to attract the attention of final year students and to encourage them to apply for a graduate career with an insurance giant that was very different from the rest – after all, Lloyds of London specialise in the biggest challenges out there, such as insuring against falling rocks from the sky! This earth-shatteringly good idea went on to win lots of awards, including the Work of the Year at the RAD Awards. Fast forward to the present and we still have lots of graduate recruiters trying to make a physical mark on campus. Now though, they have much better technology to help them. We really like the way Thales (with their agency AIA Worldwide) have been promoting the reality of their graduate careers with students. As specialists in the world of Defence it made sense that they showcased some of their technology and so it was no surprise to see military helicopter simulators appearing at Graduate fairs. What we really liked though was the simple smartphone app that allowed students to see themselves wearing the augmented reality TopOwl helmet (think Google Glass on the battlefield). Very simply, augmented reality became both the key message (come work for us because we develop gear like this) and the communication channel to deliver it. A great idea. Technology has continued to drive much of the innovation in campus marketing. A few years ago, Reckitt Benckiser (with their agency Havas People) became the first company to create a business game application, poweRBrands, that allowed people to take on a virtual role, in a virtual office, to understand what it would really be like to work for the organisation. Based on the popular apps of the time – Cafe World and Farmville – the game went on to win lots of awards and made a real statement about what was possible with technology. Another great example of bringing a brand’s reality forward for a student audience. We understand that poweRBrands has just been relaunched, so go have a play! The trend-watchers have called it SoLoMo. Simply, it means social, local and mobile. Even more simply, it’s when your phone can activate something right where you are, the transaction leaving its imprint in the social media world. It’s not new – German billboards were dispensing dog food (yes, dog food) in this way back in 2011 – but it’s now picking up some pace. 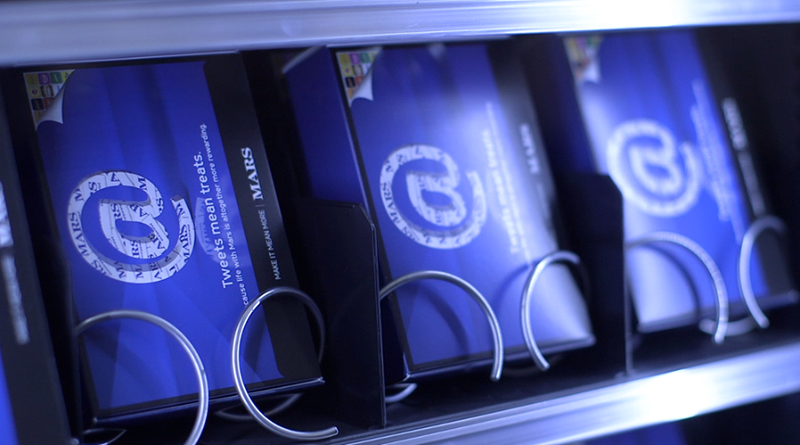 We like this idea from Mars (and their agency Tonic) who put Twitter-activated vending machines on campuses to engage with potential graduate applicants. When students tweeted the machine using #MarsTweetShop along with the unique code on the machine display a prize (Mars product plus information on graduate careers) dropped out for them. Not surprisingly, Tonic talk about this neat idea on their site and there’s a video too. Most of the best campaign ideas on campuses now mix on and offline communications. A big award winner in 2013 has been Deloitte’s approach to graduate recruitment (again, Havas People are the agency behind this). Sometimes the really big names, such as Deloitte, can become a little faceless – a particular problem if much smaller competitors are oozing personality. Deloitte decided to make the face important and used sketch artists to encourage students to sit down and talk about Deloitte, whilst having their portrait done. If you’ve ever been in a situation when you’re told to sit still for a few minutes ‘whilst I sketch you’ then you’ll understand the potential of using that time to have an engaging conversation. Deloitte got some precious minutes, students walked off with professional portraits, and Facebook got in on the act too as hundreds of pictures were uploaded in gallery format to encourage further engagement from the students. The financial world has taken a battering recently. The big banks have had to pick their reputations up off the floor. So, it’s refreshing to see that RBS is encouraging well-rounded, global citizenship in its graduate recruitment communications. Have a look at the Indian Summer challenge and follow the stories of students linking real world issues and experience with a potential career in finance. The winners of the challenge get to go to India for 3 weeks to experience a different culture. A good eye-opener indeed. We’ve had virtual reality. We’ve had social media reality. However, the biggest award winner for graduate communications in the last year appears to be an organisation that simply does reality. Enterprise (as in car rental) tells you as it is. They tell you what it’s really like to work there. They do this through a well maintained blog network and through some well-crafted, honest communication. We really like it because whilst we are told about a company where people matter, and backgrounds don’t, there are the facts and the actions to back it up. There’s nothing elite here. Anyone can apply and anyone could get a job. Diversity at its best. Have a look for yourselves. We finish off in the domain of consumer advertisers and how they are standing out on campus. It seems vending machines are just as popular with this crowd too! Have a look at this video of how Coca-Cola made its mark on a London university campus. Almost 1.5m people have viewed this video – a good reminded that if you can capture engaging local activity there’s always a potential to have a much bigger reach. Hundreds of campuses, over 50 countries. Still going strong. But do you really think a helicopter dropped them? For more snapshots of inspiration please follow us @futureindex and jump to our website to see how we can help you apply it to create your own breakthrough ideas. You’re welcome. It’s great work!